Have you signed up for my free webinar on tracing Ulster ancestry this Saturday? I am pleased to be offering the first session in the Southern California Genealogical Society 2017 series of monthly webinars. 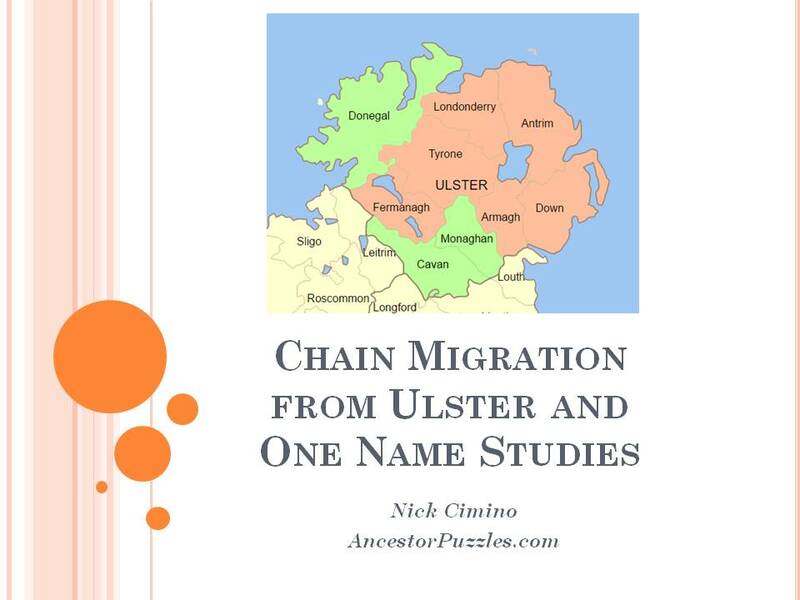 My session entitled "Chain Migration from Ulster and One Name Studies," will be presented live this Saturday, January 7, 2017 at 10 AM Pacific Time. Members of SCGS can also view the session at anytime after the live presentation through their webinar archive. The hyperlinks above can be used to view the program overview and the registration page for the Ulster Webinar. Due to the scarcity of Irish records an excellent genealogical approach is to widen the focus from a particular pedigree to all occurrences of a surname in your Irish locality whether it be a townland, a county or a region like Ulster. Unfortunately, due to fires and government record destruction, you will never have all of the pieces of your Ulster "Ancestor Puzzles." By systematically gathering all records relating to your subject surnames you can piece together you Ulster ancestry like a jigsaw puzzle. For historical context visit the Collections page of the Ulster American Folk Park. The Folk Park tells the story of hundreds of thousands of emigrants who left Ulster to emigrate to America in the 1700s and 1800s. The Park was opened in 1976 to celebrate the 200th anniversary of the Declaration of Independence. For primers on Ulster genealogy and history,visit the "Leaflets" page of the Public Record Office of Northern Ireland. The ‘Your Family Tree’ and ‘Local History’ series’ are designed to assist both the beginner and the more experienced researcher. They cover the most popularly consulted archives, indicating their range and content and how they can be accessed. Other series’ relate to emigration, historical topics and more general information. For an overview of Irish genealogy research visit the Introduction to Genealogy Page of the National Archives of Ireland. The links to the genealogy page include the Irish census records of 1901 and 1911 and many other resources. Last but not least is the free genealogy service of the Irish government called IrishGenealogy.ie. This page includes an every increasing collection of both indexes and original images for Irish Civil and Church Records. I hope you will join me live for the webinar on Saturday or join SCGS to view the webinar in their archive. All the best in your genealogy pursuits in the New Year!